It's that time of year again. I don't just mean the holidays, I mean FINALS! At colleges across the U.S. college students are busting their humps on final assignments and hitting the books in preparation for final exams. Yesterday Icy and I participated in a STRESS BUSTER event at a local University. A lot hinges on finals and sometimes students can become unhinged from all that stress - Therapy Dogs to the rescue! 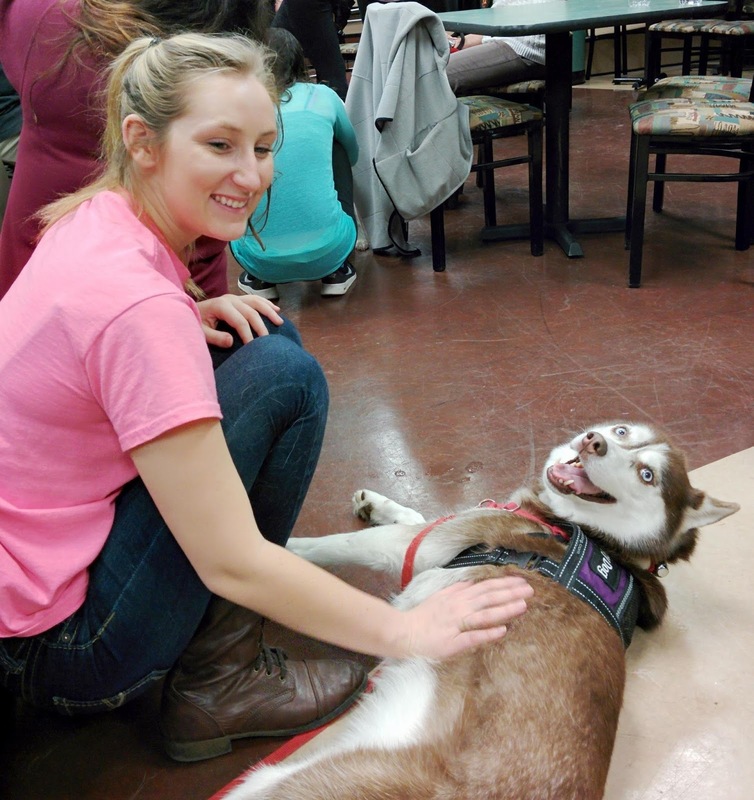 At this time of year Therapy Dogs participate in Stress Buster events at colleges, to give students a break from their studies and reduce stress with licks and wags! 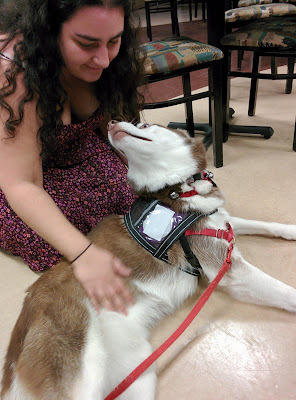 I'm not sure who enjoys these visits more, the students or the Therapy Dogs! Someone's about to get kissed! 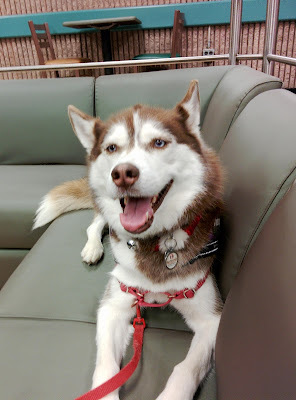 Icy takes a rest after a Therapy Dog's job well done! If you enjoyed this post, you may also like my post on Why Children Should Read To Therapy Dogs to improve their reading skills. Leave us a comment and share your thoughts on Stress Buster events for students! Yes, and after their visit, relaxed students too! Thanks for stopping by Earl & Ethel! 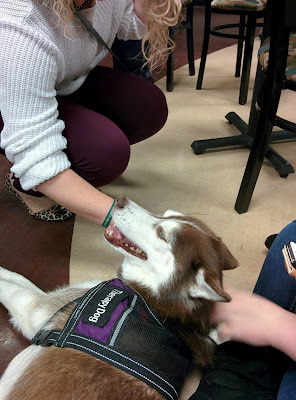 We got to participate in some therapy work for finals last week. We took the guinea pigs, scooby and me and let all the students come to pet us. We spread smiles all over the room. How wonderful! I'm sure the students just loved you. Thanks for stopping by today! What a super fun event! It's definitely one of the more fun Therapy Dog assignments. Thanks for stopping by today! It sure is! Thanks for visiting us today. I think it is great that they allow the therapy dogs in during finals, I will have to look that up. I lost my therapy dog place to go on Fridays so I'm missing it with my gang. So sorry you lost your Friday therapy dog place! I'm sure you'll be able to find plenty more, so many places are welcoming therapy dogs now. Thanks for stopping by JoAnn! I wish my college had participates in that when I was in school! What an excellent idea! I think so too! It's such a fun event, the students just love the dogs. What a fun thing to do! I'm hoping to do some minor therapy type things like this with Penny. Neat! I love therapy dogs! This is so wonderful! I've never heard about this type of therapy. I bet my step-son could have used a good cuddle last week when he was taking his first-semester freshman finals! Oh wow! That is so neat that you are able to take Isis and help the college kids! She looks like she's having fun! That's such an awesome idea. I would have loved that when I was in college. I missed my dog soooo much when I was away at school! I need sme therapy! When ya coming to visit!?? This is so awesome!! I get stress relief with Bean all the time. Oh cool! We haven't gone to any schools with Mr. N yet. What an awesome idea! I wish my college had visiting therapy dogs when I was in school! Looks like Isis really enjoys her work! Aww, sweet, you must have been a huge help! I remember taking my finals after my dog passed away, when I was between dogs - it was tough to not have a fuzzy friend to take study breaks with! What a great idea! I would have loved this in college. It looks like everyone had a great time. This was very sweet of you to do. Therapy dogs are really important for many communities. I've seen the dogs that children read to - it's a very cool program here in Portland. This is such a great initiative! We did that last year and Harley really enjoyed all the love and attention. Merry Christmas my friend! So great that you were able to provide a calming session for some much needed relief! Looks like a lot of fun! This is awesome. I am sure these students feel better and will perform better. the students and dogs look so relaxed! Great energy from everyone! Such a wonderful idea for students. As a former college professor, I needed a therapy dog, too. This is such a great idea. I never really thought about therapy dogs for finals week. What a great idea! Great idea! I know when I'm pulling my hair out over a project, even five minutes with the furries calms me down. What a cool event! I wish they had something like that when I was a student, I know how much it helps! Win-win! God for the humans and good for the dogs! I love these programs. I saw in the research for my documentary series that Dogs really have healing powers. They definitely can help reduce stress, increase focus and improve mood for many people. Finals can be so stressful so I'm sure your visits really help. They look like a lot of fun too. Such an excellent concept, well delivered!! WOW what a fantastic idea - I know I told you on FB, but I love the idea of a therapy dog at a college - what a stress buster for sure. Nice blog Growth and Care has provide you Play therapy London,Islington, united kingdom, play connect transform, Fun London.Karine Brûlé offers confidential Psychic Therapy and Development sessions,Development workshop London, pet psychic, cat therapist, Psychic personal development, relationship counselling. Icy you would make anyone happy just being able to pet you and see your smiling face :) I think we need more therapy dogs in schools and offices! Our buddy Summer the Somali is a therapy CAT and she sometimes visits students at UCLA (I think it is...) so I know the positive impact a therapy animal can have. Thank you Icy and Mom for minimising the stress levels of so many hard working students. These young people work so hard that it isa pleasure to see the smiles. Dogs are amazing and great therapy for anyone really! I am not shocked to see them providing therapy in this way at all! My daughter has a therapy dog but of course he is also a family member to us. Pets as a whole are so therapeutic! I am sure this was a very welcomed break for these students! This is such a great idea. I remember my college having a similar event when I was in school. I think I remember a bunch of puppies in the quad one afternoon. Glad that Icy was able to participate and ease some of the stress for the college students! Looks like fun for all. I never heard of this before! I would be selecting a college based off which ones had these programs. This is so awesome! I never went to one when we had therapy dogs visit campus. Wish I had now! This is such a great idea, I wish we had therapy dogs when I was taking exams. I used to get so nervous, I actually sat in an exam and forgot my name! A therapy dog would have definitely calmed me down. 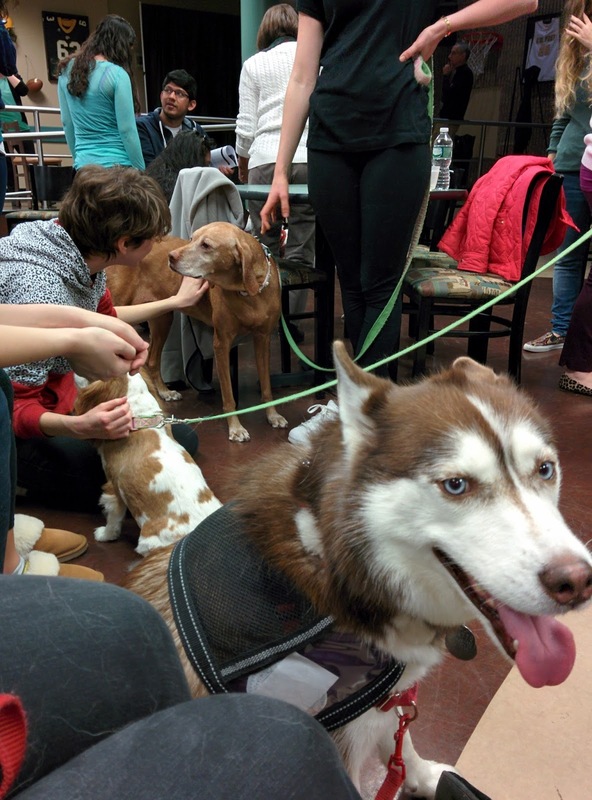 What a great idea to have dogs come to the universities to help relieve some stress from final exams! Oh this is sweet. I remember those college days being stressed about finals and papers. This is a great idea to help students relieve some of that pressure. A great morale booster too. Dogs are great at easing stressful college moments. This is such a great idea! This is a great idea! I wish they did this at my school. I'm actually studying for finals right now and I can say it is definitely stressful! But this would be a great stress reliever after an exam. The community college where I teach has therapy dogs during finals. I always like to stop by and see them. Maybe some day I'll be able to do that with one of my dogs. I love this! Icy looks like she had just as much fun as the students. Animals are truly a gift and have a beautiful way of making us feel better. Bravo! That is so awesome! I'll have to ask my son if they have therapy dogs that come to visit his college. I am sure he would love it.